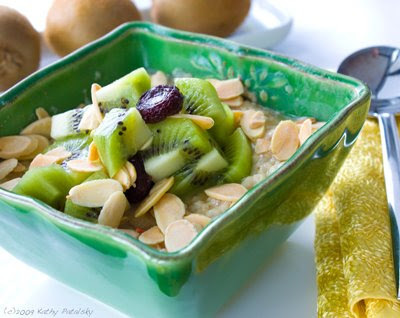 Recipe: Kiwi Cherry Almond Oatmeal. At-Home. Too Easy. Oatmeal, made quick and easy, seems to be popping up all over the place: Starbucks, Jamba Juice and even pre-cooked in your freezer section! Well the truth is oatmeal is so easy to make at home. 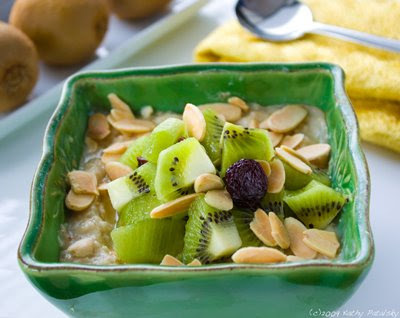 In just a few minutes you can be eating hot creamy oatmeal topped with fresh fruit, nuts and other creative toppings. In your socks. 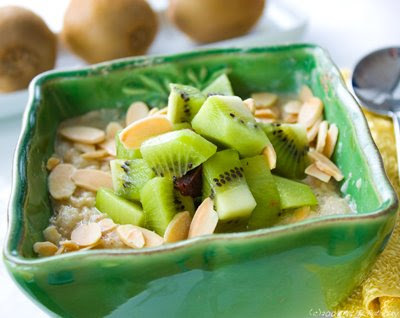 Do you really want to be eating on-the-go oatmeal, when it is such an easy at-home breakfast? I prefer to be at home, in my socks and eating steaming hot oats out of a nice porcelain bowl - with my own non-plastic spoon. Plus, nothing beats fresh cut fruit on top of oatmeal. Creative Toppings. Oatmeal is like ice cream. You can top it a million different ways. My fave? 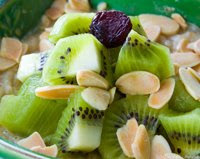 Fresh cubed kiwi, dried whole Bing cherries and thinly sliced roasted almonds. Add a dash of cinnamon and some creamy soy milk and I am in oatmeal bliss. Healthy Bowl. Kiwi's are super high in vitamin C. Almonds are high in vitamin E. Cherries are high in vitamin C. And the whole bowl if full of healthy fiber. Plus protein from the soy milk. Antioxidant-oatmeal morning! Heat oatmeal and water in bowl for 1.5-2 minutes. Add nuts, cinnamon, buttery spread, agave and cherries. Put back in microwave for 20 seconds. 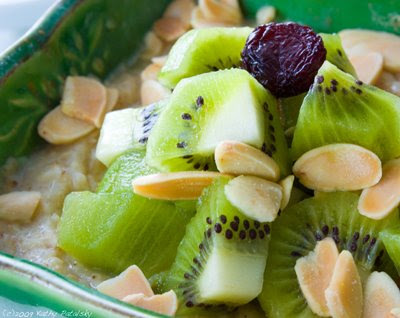 Add soy milk and top with kiwis and a few loose almonds and cherries. Sprinkle another dash of cinnamon.